Key to selling homes, especially in this market, is Maximum, Professional Exposure of that home. The Renee Amey Team at RE/MAX Elite is proud to provide a website that presents homes in a dynamic, visually pleasing way that makes featured homes on this site look extraordinary! This can only be done with professional photography of homes and custom web design. This market demands extra time and money to be spent on presenting properties in such a way that distinguishes featured homes from the rest. The use of cutting edge technology is no longer a luxury, but a requirement to selling a home. 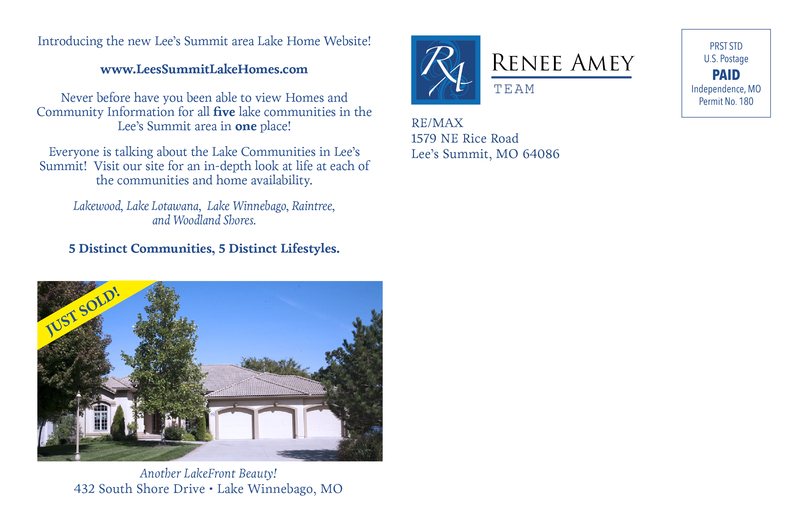 The Renee Amey Team features a variety of homes on their site with a special section (tab) for Lake Homes on the Home Page. See this area of the site for an in-depth look at each of KC’s 12 Lake Communities including: dynamic pictures of each community, interactive community map, lake community comparison sheet, homes available at each community, codes & restrictions, & community newsletters. Have you received our postcard as seen below? 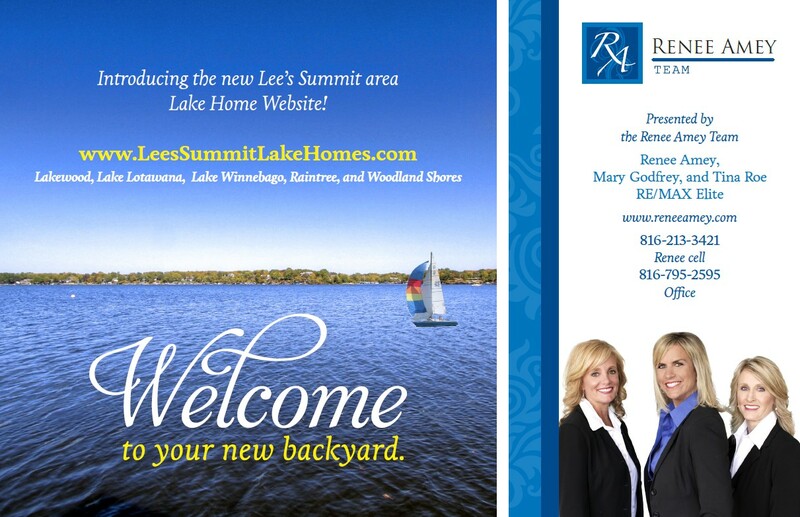 If not, please email or phone us to receive more updates on Lake Home Opportunities. Take a personal tour with Renee of this amazing home on Lake Lotawana! Inviting floor plan with 2 huge decks just steps away from the the extra large personal dock with 3 lifts. Huge living spaces, vaulted ceilings, spacious finished basement with 2nd kitchen and a rare find of a 3 car garage. Premium cove location! You do not want to miss this!